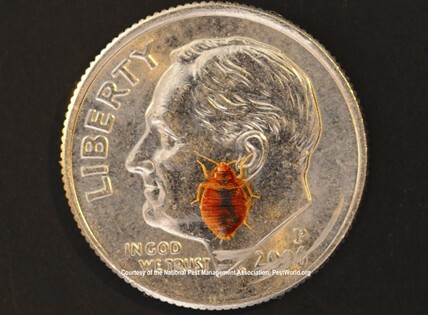 Bed Bugs are flat, oval-shaped and generally not longer than 1/4 inch in length (photo credit National Pest Management Association). Since the 1990’s, bed bugs have become more common not only in the media but also in our homes, places of works, and places of entertainment. The key to helping to prevent a bed bug problem in your structure is identification and taking preventative measures whenever you visit a place of possible activity. NEW-TEC offers everything from monitoring for and treatment of bed bugs. Adult bed bugs are light brown to reddish-brown and sometimes almost black depending no when they last fed. They are flat, oval-shaped and generally not longer than 1/4 inch in length. Nymph (or new hatched bed bugs) are often transparent (clear) and only darken as they mature. Know where bed bugs like to hide and inspect rooms before bringing in bags. 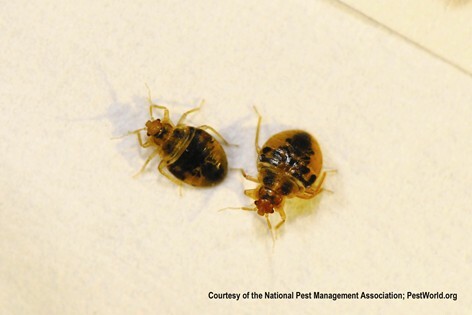 Always check bags when returning home from any stay outside of the structure for live bed bugs or bed bug eggs. NEW-TEC recommends placing your luggage into a dry bathtub and removing all garments. All garments should then be washed and dried on high heat (when possible). Luggage should then be inspected around interior and exterior for possible live bed bugs or bed bug eggs. Don’t assume that just because you don’t have any bites that you did not bring bed bugs home with you. Bed bug bites can take up a few days before they appear on the skin. If you visit gyms, have personal bags that you take back and forth to work, or if you have children with backpacks that they take to school, NEW-TEC recommends you place these bags in sealed plastic containers each evening when you return home. All clothes should be washed and dried on high heat (when possible) immediately upon returning home. 80% of bed bug activity will be around the bed or other sleeping areas. Inspect your mattress as well as around your bed for evidence of bed bugs. 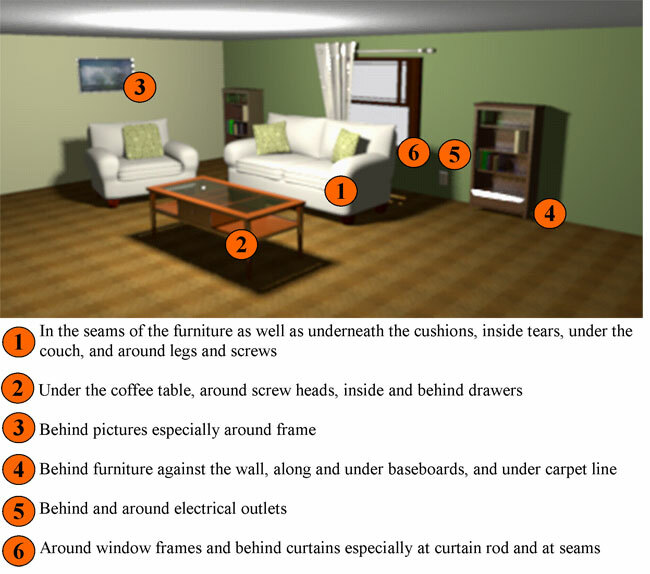 If you suspect that your structure has bed bugs or that you have brought them in, contact a professional immediately. The longer you wait, the more it will cost for treatment. Every structure is different and every situation must be assessed as to method of treatment. NEW-TEC offers insecticide treatments to bed bug harborage areas or steam treatments for chemically sensitive accounts. Kills active bed bugs and their eggs. Residual will kill bed bugs that emerge from untreated areas. No residual treatment. Steam cannot penetrate walls or other insulated areas for a long enough period to kill active bed bugs or their eggs. As these bed bugs emerge, there is nothing to kill them. NEW-TEC offers short term or long term active bed bug monitoring as a stand alone service or added to your quarterly pest control. Unlike the old method of putting out traps and hoping a bed bug crosses, we now have active monitors that release a pheromone to attract the bed bugs over a 90 day period. Whether you suspect bed bug activity or you are worried that you may get bed bugs, active monitoring is the solution. According to the National Pest Management Association, only 33% of people who said they have active bed bugs in their home will notify their guests. Bed Bug inspection dogs that test as high as 98% accurate in lab situations oftenfall below 50% accuracy in real life scenarios. According to the National Pest Management Association, when a canine identifies an area with a positive indication, the handler should always confirm the presence of bed bugs before concluding that the structure has active bed bugs. Bed bugs can last several months without feeding – leaving a home empty will not kill the bed bugs. Bed bugs can survive extreme temperatures, from nearly freezing up to 122 degrees Fahrenheit. Bed bugs can ingest up to 7 times their weight. If you have questions or concerns about bed bugs, call NEW-TEC today at 843-873-5103 or 843-849-3668. You can also request a free no obligation quote or contact us online with your questions and concerns. A free quote does not include a full inspection of the property. If you are not sure if you have bed bugs and would like a full inspection, there is a charge.